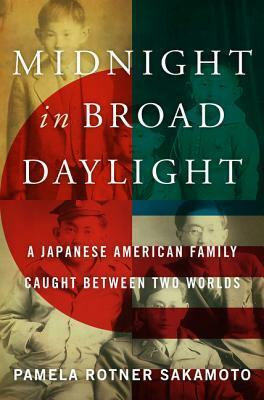 Meticulously researched and beautifully written, Midnight in Broad Daylight is the true story of a Japanese American family that found itself on opposite sides during World War II. An epic tale of family, separation, divided loyalties, love, reconciliation, loss, and redemption, Pamela Rotner Sakamoto’s history is a riveting chronicle of U.S.-Japan relations and of the Japanese experience in America. I love history but oddly I don’t love to read about history. I often find them to be a bit boring, or filled with too much information but no story to it. I can count on one hand the number of Nonfiction books I’ve read that I’ve actually finished, Midnight in Broad Daylight being one of them and I loved this book. It tells the story of the Fukuhara family. Parents born in Japan and immigrants to America, who raise their 5 children in a mixed cultural upbringing filled with the traditions of Japan and the modern aspects of America. The book closely follows the lives of two of the brothers Harry and Frank. Harry is the 3rd child and Frank is his younger brother. After the death of their father and the start of the Great Depression in the United States, the boys who have spent their whole lives in America are moved to Japan by their mother, along with their 3 other siblings, to be closer to family. Harry vows to return to America the moment they are forced to move and does after he finishes school. He comes back to find that the town he grew up in and the friends he left behind don’t have a lot of interest in him any more, nor does the small town have any jobs to offer during the depression. Moving to Los Angles, Harry bounces from job to job before moving in with a middle aged couple as their house boy. The couple, who have no children of their own, treat Harry as though he were their son. They even take in his sister, Mary, and her young daughter when she shows up after escaping her alcoholic and abusive husband. Then after Pearl Harbor, Harry and Mary are sent to an interment camp until Harry is able to join the United States Army as a translator. Mean while Frank is still in Japan. He is admitted into an elite school where he learns the ideology that heavily influences Imperial Japan. Frank and one of his and Harry’s other brothers, Pierce, are drafted into the Imperial Army. Reading the Fukuhara story opened up a whole new world of curiosity for me about Japan, World War II, and cultures here in America. This family’s story was heartbreaking and hopeful all at once, and presented a timely read even though it was experiences the Fukuhara’s went through nearly 75 years ago. As an American I’m often surprised by how our society can be xenophobic because we are a rare group of people as our country is also not our ethnicity but rather built from many different ethnicities. I alone can rattle off a long list of where my heritage comes from just like many others, but somehow we always tend to ignore that when it comes the the new immigrants who make their way to the United States. Midnight in Broad Daylight shows the nastiness of xenophobia but also displays the strength of a family who attempt to move forward even when those around them want to hold them back because of who they are.